Walked-up grouse shooting over pointers commences in September. After a recent downturn in numbers of birds, the estate’s grouse moor has returned to productivity. In 2009, over 16 brace were shot over a four-day period by 2 guns going out 3 hours a day. The most prolific areas are the moorlands along Loch Seaforth and Loch Langavat. 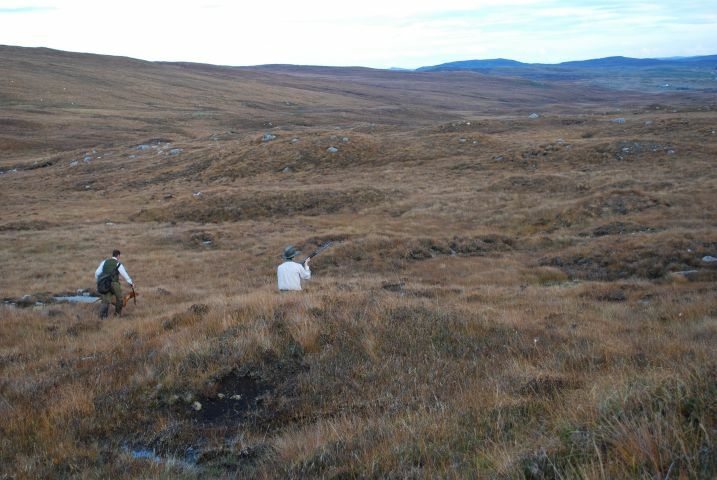 Grouse shooting is available to tenants of the Lodge at a price of £600 per day. Driven woodcock shooting is available to tenants of the Lodge at a price of £600 per gun per day for parties of 5 to 6 guns. The season is mid November to end of January. Walked up woodcock shooting is available for parties of 3 guns and costs £600. Depending on numbers, snipe shooting may be available from late September onwards. Snipe will generally be found by streams, ponds and similar wet areas scattered throughout the moorland. Duck shooting on our several flight ponds can be exciting in the evening with good winds. Occasionally early in the season geese fly over as well.